As I’ve come across a couple of posts recently that address the natural environment it occurred to me that there is often a disconnect between the city and nature. It made me pose the question: how integrated can the urban fabric be with its natural surroundings? Architects are often very successful at this. In architecture school we spent hours marrying the design of our structure with its site. How did we best exploit what the landscape best had to offer? Some of the best at doing this were Frank Lloyd Wright, Alvar Aalto, and Antoni Gaudi. So, what can we learn from these pioneers of design? First we must understand the influence that industrialization has had on the city. Cities were very dirty for a very long time. During the pre-industrial revolution they were just filthy: dirty roads filled with waste that often led to disease and plague. During the post-industrial revolution, factories left soot on the buildings and in the air. With growth and wealth came the mind-set that the city was something that must be escaped. Of course now this opinion has been eradicated with the city becoming synonymous with culture, diversity, and entertainment. But with industry came the destruction of nature. And this is very much a residual identity of the city. In answer to the belief that the city must be escaped was the Garden City movement. Originating in England as the brain child of Ebenezer Howard, it quickly spread to America, and other parts of the world. 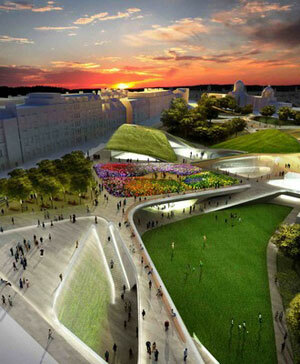 His thoughts were very much based on bringing nature into the built environment. Touched upon in one of my recent posts, The Original Suburb, this movement laid the foundation for suburbia as we know it today. However, built environment professionals have condemned modern-day suburbia for the many negative effects its had on the environment, communities, and the local economy. It’s low density and wide streets could achieve foundations that Howard set out at the turn of the last century, but instead they have come to represent a wasteland. As a result, the one city planning movement that really set out to incorporate nature with the built environment has been condemned by association with what the very movement inspired in the first place. So where does that leave us? How do we create an environment that is still very much urban but incorporates elements so that people benefit from feeling emotionally connected to nature? One of the defining characteristics of a city is its density. More buildings in less space allows little room to exploit the land. An extreme example of a dense neighborhood is the walled city of Kowloon, Hong Kong that was torn down in 1989. You can see from the pictures that there were zero opportunities to appreciate the natural landscape, natural light, ventilation, or water that lies beyond its walls because of its high density. There is a mentality of the traditional American grid that it must be rigid and efficient, which comes from the fact that many places in America were masterplanned instead of growing organically. The best example of course is New York City, check it out here. But connectivity and permeability do not require a certain shape or design. Movements, such as Transit-Oriented-Design and New Urbanism, can still be successful while creating an interesting, connected, and efficient grid that shies away from the unforgiving rigidity of historic masterplanned towns. The open green space that is often found in cities is anything but natural. While they serve their own, very valuable purpose of social inclusion and economic sustainability (see a great example of Savannah here) their perfectly manicured state clearly show that the “green” was inserted back into the grid instead of preserved. I came across a great blog post entitled A Garden City for the 21st Century, that details a new project in Aberdeen that is revitalizing its center and reconnecting the city to its natural landscape. While it has many inherently positive intentions and I am sure achievements, this over-engineered public space is not natural. We should learn to tell the difference. Any development is composed of morphological levels: streets, blocks, plots, buildings, and open space to name a few. The design is in how these elements are put together. This is never more important than in preserving the natural landscape. Just as an architect, an urban designer must study a site carefully to determine its unique characteristics that will add natural character to a development. Whether it is beautiful views, the feeling of inclining up a hill, maximum interaction with water, creating space to sit under tall trees…all of these are exploiting the natural, or what is already there. When creating the first morphological layer, streets should be placed to maximize the natural elements of the site. Block Orientation – light studies should be carried out as a tool in designing the block orientation. In dense urban environments, buildings can overshadow open space and create a dim and dark environment. If blocks are orientated to maximize sun exposure throughout the year users will feel more connected to nature. Perimeter Blocks – perimeter blocks (with buildings around the outside facing the street) allow the preservation of trees and natural growth in their center. Animals often live here. Preservation of the Green – preserve the most unique parts of the natural landscape instead of building them back into a grid. While Central Park certainly is beautiful in its own right, it was designed and built from scratch by Frederick Olmstead. As a result nothing remains of Manhattan’s original natural landscape. Visual Connection – preserve views of the natural environment that surrounds the development. Design the streetscape so it frames and celebrates these views. Landscape Details – when all else fails always use natural, local materials and indigenous plants in the city. 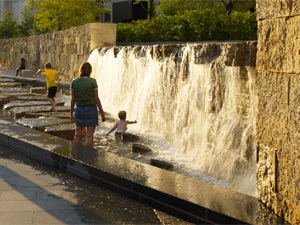 A great example of this is a water feature in the St. Louis City Garden, the winner of the 2011 ULI Amanda Burden Open Space Award. Naturally shaped stones welcome interaction with resources, such as water. As a quick example I want to share a masterplan that I designed as part of a larger group of urban designers. The site was a flood plain and bordered by creeks that constantly overflowed. Instead of concreting the banks of the creek to move the water faster downstream away from the site, we preserved them in their natural state. In doing so we saved many indigenous plant and wildlife species. By making room for the water we able to use the flood risk of the site as an opportunity for residents to emotionally connect with their natural environment. A greenway with bike paths and leisure activities, as well as the incorporation of an extensive swale system allowed green elements to be constantly present in the development. By creating a street hierarchy of a strict grid that was interrupted by 3 undulating boulevards that followed the contours of the land, the development preserved the natural conditions of the site while achieving the densities of a city. So yes, I do believe in using some of the tools above that the city can be natural. Of course achieving this will come down to the same thing it always does: the power of money and policy. 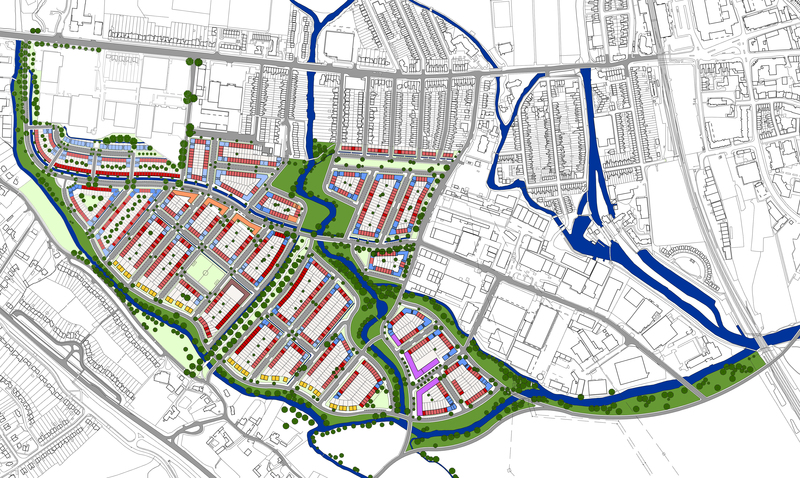 Planners must put in place the structure of policy that rewards investment in the preservation of the natural landscape and the use of sometimes more expensive local materials and species. They must also learn to communicate with developers their direct benefits – return on investment and acquiring grants and public funding. Even in achieving this, built environment professionals must be educated in high-quality design and its direct positive effects. You can’t implement high-quality design, if you can’t recognize it.